We need energy for everything we do. Energy is used all around us. There are many different forms of energy like heat energy, light energy, and sound energy. Due to this, there are many different ways in which we use energy. There are many different ways to get energy. These are called sources of energy. The day is warm and bright. It is the Sun which gives us light and heat energy. So, Sun is a source of light and heat energy on Earth. The people walk, talk, and play. They get their energy from the food they eat. Vehicles like cars and bikes run on road. They get their energy from gasoline. We listen to radio in a car. It runs on electrical energy from the car's battery. 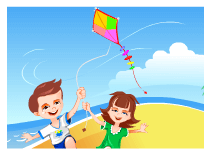 We can fly kites high up in the sky because of wind energy. 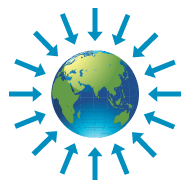 When kids slide down a plane or roll down a hill, some of the energy comes from gravity, called the gravitational energy. We use heat energy to cook food. 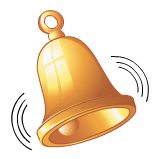 The bell rings and sound energy is produced. 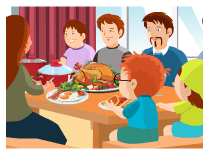 This sound energy reaches kids' ears to tell them that dinner is ready. What happens to energy after you use it? Do you use it all up, and it disappears? Energy is neither created nor destroyed. It just changes from one form to another. 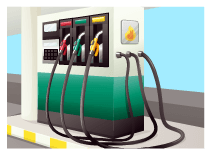 When vehicles like cars and bikes run, the chemical energy of the gasoline is converted into mechanical energy. 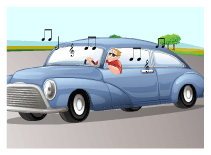 When we play a car radio, the chemical energy of the battery is converted into the sound energy. When we play a music system, the electrical energy is converted into sound energy. When we switch on a room heater, the electrical energy is converted into heat energy. Energy is the ability to do work, that is, to move or change something. Forms of energy are the ways energy is used. Sources of energy are things we get energy from. Energy is used all around us every day. Energy is used by people to move, talk, and play. 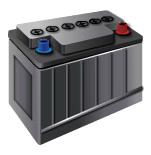 Energy is used by cars, radios, toys, fires, and musical instruments. There are many ways to use energy. There are many ways to get energy, too. Energy comes from the Sun. It also comes from the food we eat. It comes from gas, and from electricity. It comes from wind and fire. It comes from gravity too. A. Be an Energy Detective! Find sources of energy. Can you think of something that uses water for energy? Two things that use food energy. Two things that use energy from the Sun (for heat and light). Two things that use wind energy. Two things that use electrical energy. Two things that use heat energy. Two things that use sound energy. B. Forms of Energy: Make a roller coaster! Place a few books on top of each other to make a stack. Place a tall book against it such that it's lying inclined leaning against this stack. This tall book acts as our ramp. Place an empty carton at the bottom of the ramp with its opening facing the foot of the ramp. Place the marble at the top of the ramp, and let it go. Did the marble push the carton with the energy it got coming down the ramp? Measure how far it moved. Try this with the marble starting from different points on the ramp. How does that affect its energy? Now try a different-sized marble. Which marble gains more energy-the smaller or larger one? C. Forms of Energy: Make a Musical Instrument! Stretch four rubber bands around the box such that it stretches over the hole. Put a pencil under the rubber bands over the hole such that the rubber bands stretch over it. Tape a paper-towel tube to the side of the box to make the neck of the guitar. Play your guitar! Experiment with the sound you create by strumming the rubber bands. D. Forms of Energy: Use the Sun's Heat to Melt Chocolate! Place one piece of chocolate on each paper plate. Put one plate outside in the sunlight. Put another outside in the shade. Place the third plate indoors in a sunny spot. Place the fourth plate indoors in a dark spot. Wait for an hour and compare your results. What did the heat energy do to the chocolates? Which chocolate melted the fastest? 23,218 Downloads Read Lesson! Grade 1, 2, 3	(627)	How Is Sound Produced?